The Christmas season is upon us and we couldn’t be more excited! No, it’s not because of the presents, the movies, the hot cocoa, or even a reindeer with an overly shiny nose. 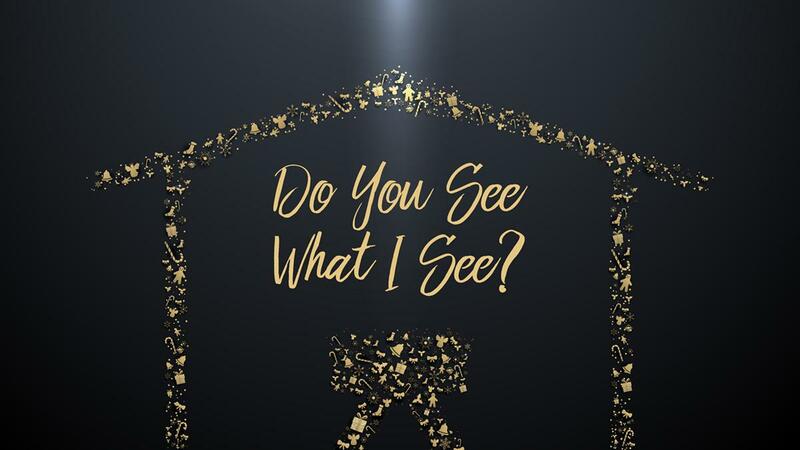 No, we’re pumped to start our new series “Do You See What I See?” this Sunday at the Graham Cinema! With all of the craziness and stress that comes with the season, it can be easy to lose sight of what makes this time so special: the birth of Jesus Christ! But as for me, it is good to be near God. I have made the Sovereign Lord my refuge; I will tell of all your deeds. 21 So get rid of all the filth and evil in your lives, and humbly accept the word God has planted in your hearts, for it has the power to save your souls. 22 But don’t just listen to God’s word. You must do what it says. Otherwise, you are only fooling yourselves. 23 For if you listen to the word and don’t obey, it is like glancing at your face in a mirror. 24 You see yourself, walk away, and forget what you look like. 25 But if you look carefully into the perfect law that sets you free, and if you do what it says and don’t forget what you heard, then God will bless you for doing it. Come near to God and he will come near to you. Wash your hands, you sinners, and purify your hearts, you double-minded. “You search the Scriptures because you think they give you eternal life. But the Scriptures point to me! 40 Yet you refuse to come to me to receive this life. You love him even though you have never seen him. Though you do not see him now, you trust him; and you rejoice with a glorious, inexpressible joy. 9 The reward for trusting him will be the salvation of your souls. Don’t worry about anything; instead, pray about everything. Tell God what you need, and thank him for all he has done. 7 Then you will experience God’s peace, which exceeds anything we can understand. His peace will guard your hearts and minds as you live in Christ Jesus. 8 And now, dear brothers and sisters, one final thing. Fix your thoughts on what is true, and honorable, and right, and pure, and lovely, and admirable. Think about things that are excellent and worthy of praise. 9 Keep putting into practice all you learned and received from me—everything you heard from me and saw me doing. Then the God of peace will be with you. So they hurried off and found Mary and Joseph, and the baby, who was lying in the manger. 17 When they had seen him, they spread the word concerning what had been told them about this child, 18 and all who heard it were amazed at what the shepherds said to them. 19 But Mary treasured up all these things and pondered them in her heart. 20 The shepherds returned, glorifying and praising God for all the things they had heard and seen, which were just as they had been told. The people walking in darkness have seen a great light; on those living in the land of deep darkness a light has dawned. 3 You have enlarged the nation and increased their joy; they rejoice before you as people rejoice at the harvest, as warriors rejoice when dividing the plunder. 4 For as in the day of Midian’s defeat, you have shattered the yoke that burdens them, the bar across their shoulders, the rod of their oppressor. 5 Every warrior’s boot used in battle and every garment rolled in blood will be destined for burning, will be fuel for the fire. 6 For to us a child is born, to us a son is given, and the government will be on his shoulders. And he will be called Wonderful Counselor, Mighty God, Everlasting Father, Prince of Peace. 7 Of the greatness of his government and peace there will be no end. He will reign on David’s throne and over his kingdom, establishing and upholding it with justice and righteousness from that time on and forever. The zeal of the Lord Almighty will accomplish this. Through Jesus, therefore, let us continually offer to God a sacrifice of praise—the fruit of lips that openly profess his name. It had been revealed to him by the Holy Spirit that he would not die before he had seen the Lord’s Messiah. 27 Moved by the Spirit, he went into the temple courts. When the parents brought in the child Jesus to do for him what the custom of the Law required, 28 Simeon took him in his arms and praised God, saying: 29 “Sovereign Lord, as you have promised, you may now dismiss your servant in peace. 30 For my eyes have seen your salvation, 31 which you have prepared in the sight of all nations: 32 a light for revelation to the Gentiles, and the glory of your people Israel.” 33 The child’s father and mother marveled at what was said about him. 34 Then Simeon blessed them and said to Mary, his mother: “This child is destined to cause the falling and rising of many in Israel, and to be a sign that will be spoken against, 35 so that the thoughts of many hearts will be revealed. And a sword will pierce your own soul too.” 36 There was also a prophet, Anna, the daughter of Penuel, of the tribe of Asher. She was very old; she had lived with her husband seven years after her marriage, 37 and then was a widow until she was eighty-four. She never left the temple but worshiped night and day, fasting and praying. 38 Coming up to them at that very moment, she gave thanks to God and spoke about the child to all who were looking forward to the redemption of Jerusalem. 39 When Joseph and Mary had done everything required by the Law of the Lord, they returned to Galilee to their own town of Nazareth. 40 And the child grew and became strong; he was filled with wisdom, and the grace of God was on him. You have searched me, Lord, and you know me. 2 You know when I sit and when I rise; you perceive my thoughts from afar. 3 You discern my going out and my lying down; you are familiar with all my ways. 4 Before a word is on my tongue you, Lord, know it completely. 5 You hem me in behind and before, and you lay your hand upon me. 6 Such knowledge is too wonderful for me, too lofty for me to attain. 7 Where can I go from your Spirit? Where can I flee from your presence? 8 If I go up to the heavens, you are there; if I make my bed in the depths, you are there. 9 If I rise on the wings of the dawn, if I settle on the far side of the sea, 10 even there your hand will guide me, your right hand will hold me fast. 11 If I say, “Surely the darkness will hide me and the light become night around me,” 12 even the darkness will not be dark to you; the night will shine like the day, for darkness is as light to you. 13 For you created my inmost being; you knit me together in my mother’s womb. My son, pay attention to what I say; turn your ear to my words. 21 Do not let them out of your sight, keep them within your heart; 22 for they are life to those who find them and health to one’s whole body. 23 Above all else, guard your heart, for everything you do flows from it. 24 Keep your mouth free of perversity; keep corrupt talk far from your lips. 25 Let your eyes look straight ahead; fix your gaze directly before you. 26 Give careful thought to the paths for your feet and be steadfast in all your ways. 27 Do not turn to the right or the left; keep your foot from evil. Every year Jesus’ parents went to Jerusalem for the Festival of the Passover. 42 When he was twelve years old, they went up to the festival, according to the custom. 43 After the festival was over, while his parents were returning home, the boy Jesus stayed behind in Jerusalem, but they were unaware of it. 44 Thinking he was in their company, they traveled on for a day. Then they began looking for him among their relatives and friends. 45 When they did not find him, they went back to Jerusalem to look for him. 46 After three days they found him in the temple courts, sitting among the teachers, listening to them and asking them questions. 47 Everyone who heard him was amazed at his understanding and his answers. 48 When his parents saw him, they were astonished. His mother said to him, “Son, why have you treated us like this? Your father and I have been anxiously searching for you.” 49 “Why were you searching for me?” he asked. “Didn’t you know I had to be in my Father’s house?” 50 But they did not understand what he was saying to them. 51 Then he went down to Nazareth with them and was obedient to them. But his mother treasured all these things in her heart. 52 And Jesus grew in wisdom and stature, and in favor with God and man. You know that when you were still pagans, you were led astray and swept along in worshiping speechless idols. I pray to you, O Lord, my rock. Do not turn a deaf ear to me. For if you are silent, I might as well give up and die.